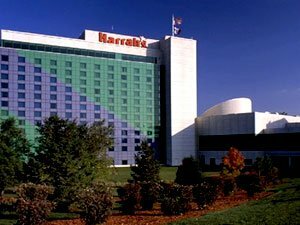 With over 500 slot machines to choose from, Harrah's Council Bluffs has the variety you want when you come out and play. Whether you prefer the traditional spinning reels or high-tech video slots, you'll find it here. 360 Steakhouse - Upscale Steakhouse - Enjoy a spectacular view with your steak from this fine dining gem situated on the 12th floor of Harrah's Council Bluffs. Stir Cove Backstage Grill - Casual American - Rock out 24 hours a day with made-to-order pizzas, burgers and more. Fresh Market Square Buffet - Casual Buffet - Mouth-watering cuisine from around the world is featured at Fresh Market Square, the very best Council Bluffs buffet.